Yesterday, the U.S. Department of Justice announced its long anticipated $7 billion settlement with Wall Street mega bank, Citigroup, over its sale of toxic mortgage-backed bonds to investors, which included pensions, charities, cities, states, hospitals and FDIC-insured banks and others. The Justice Department informed us that it had collected “nearly 25 million documents” for this one investigation. The material facts the Department of Justice released to the public in its skimpy 9-page Statement of Facts (SOF) set a new low for bare bones disclosures. Instead of Appendix 1 being filled with incriminating emails or whistleblower letters proving Citigroup’s intent to defraud, it was instead a meaningless listing of deal names which tell the public absolutely nothing. Why would a serious law enforcement agency release such a worthless document to the public? To grasp exactly what is going on here, one need look no further than the evidentiary record produced for public benefit by the U.S. Senate’s Permanent Subcommittee on Investigations in the matter of JPMorgan’s London Whale derivative bets gone bad with depositors’ money. The public was presented with a 306-page report, 98 pages of meaningful exhibits including internal emails with names, and two volumes of testimony under oath. By keeping all of the employees’ names and all the internal emails hush-hush, the public remains in the dark about where the culpability lies for these crimes against a devastated nation. “At Citigroup, meanwhile, Richard Bowen, a veteran banker in the consumer lending group, received a promotion in early 2006 when he was named business chief underwriter. He would go on to oversee loan quality for over $90 billion a year of mortgages underwritten and purchased by CitiFinancial. These mortgages were sold to Fannie Mae, Freddie Mac, and others. In June 2006, Bowen discovered that as much as 60% of the loans that Citi was buying were defective. They did not meet Citigroup’s loan guidelines and thus endangered the company—if the borrowers were to default on their loans, the investors could force Citi to buy them back. Bowen told the Commission that he tried to alert top managers at the firm by ‘email, weekly reports, committee presentations, and discussions’; but though they expressed concern, it ‘never translated into any action.’ Instead, he said, ‘there was a considerable push to build volumes, to increase market share.’ Indeed, Bowen recalled, Citi began to loosen its own standards during these years up to2005: specifically, it started to purchase stated-income loans. ‘So we joined the other lemmings headed for the cliff,’ he said in an interview with the FCIC. “He finally took his warnings to the highest level he could reach—Robert Rubin, the chairman of the Executive Committee of the Board of Directors and a former U.S. treasury secretary in the Clinton administration, and three other bank officials. He sent Rubin and the others a memo with the words ‘URGENT—READ IMMEDIATELY’ in the subject line. Sharing his concerns, he stressed to top managers that Citi faced billions of dollars in losses if investors were to demand that Citi repurchase the defective loans. “According to Citigroup, the bank undertook an investigation in response to Bowen’s claims and the system of underwriting reviews was revised. Bowen provided even more detail in a December 4, 2011 interview on 60 Minutes, ironically titled: “Prosecuting Wall Street.” Bowen tells viewers that after bringing his findings to higher ups, his duties were reassigned and he was told to remain off the premises. By late 2008, Citigroup’s serial hubris, mismanagement, hiding tens of billions of dollars of debt off its balance sheet had turned it into a financial basket case. No other Wall Street bank received the amount of life support from the U.S. taxpayer that was received by Citigroup: $45 billion in TARP funds, over $300 billion in asset guarantees, and more than $2 trillion in below-market rate loans from the New York Fed. Citigroup has dressed up its disastrous financial history by conducting a 1-for-10 reverse stock split, meaning that investors who previously owned 100 shares now own 10. That allows its stock, which closed yesterday at $48.42, to shake off the stigma of trading at its actual, pre-reverse split price of $4.84. The majority of Americans were against the Wall Street bailouts but Congress defied the will of the people. 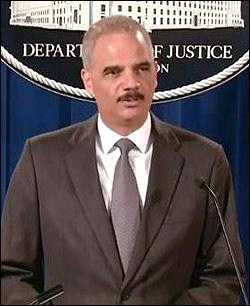 The very least the U.S. Department of Justice can do at this point, having failed to criminally prosecute a single CEO or CFO of a major Wall Street bank, is give the public names and facts and internal documents so that the public has the ammunition to push for prosecutions and meaningful legislative overhaul.